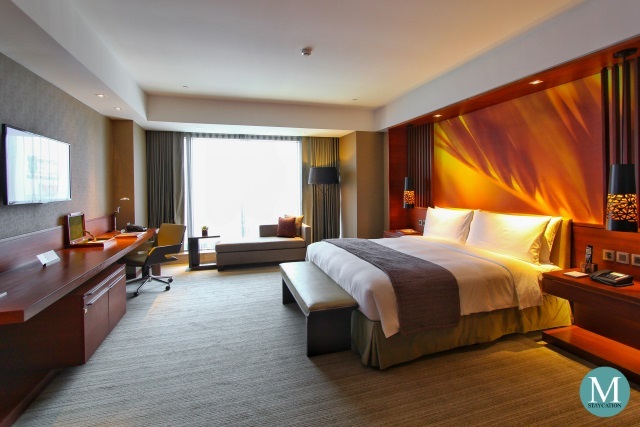 The Premier Room is the highest among the three guestroom categories of Marco Polo Ortigas Manila. 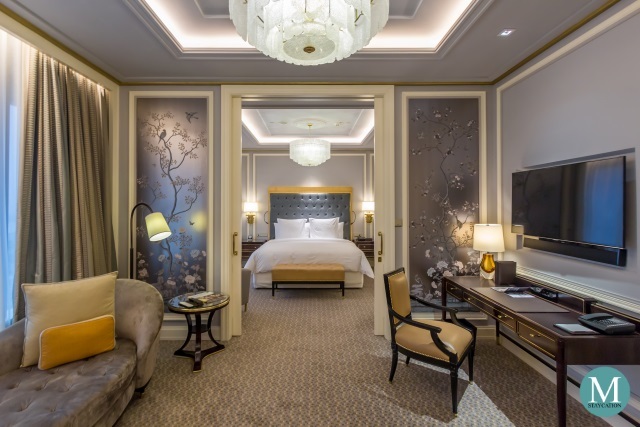 With a floor area of 51 square meters, these corner rooms are ideal for couples or small families who require the luxury of more space for a higher level of class and comfort. 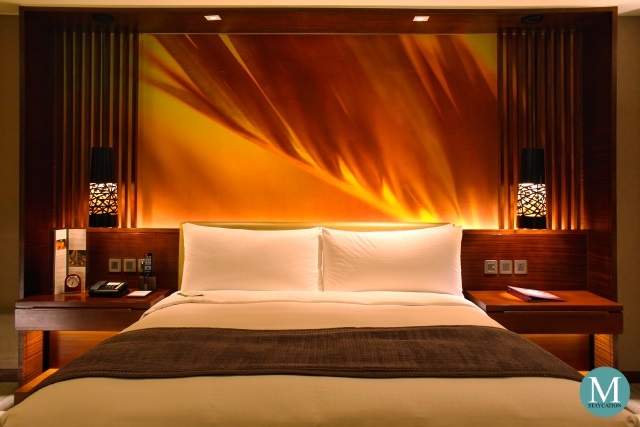 Premier Rooms are beautifully designed in an elegant earth tone finish with plenty of marbles, wood and warm lighting. Its dominant design element is the fiery orange feature wall displaying a palm frond inspired by the palm trees that dominate the landscape of Marikina Valley. 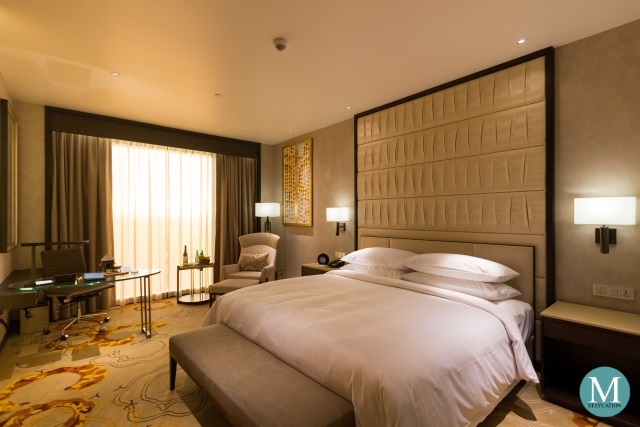 All Premier Rooms are furnished with a king bed. Switches to the lights as well as universal power outlets are located next to the bedside tables and are easily accessible from the bed. The mattress has a medium firmness and has a thick goose down topper that provides extra cushioning to the body. There's also an LCD television with local and international cable and satellite channels. 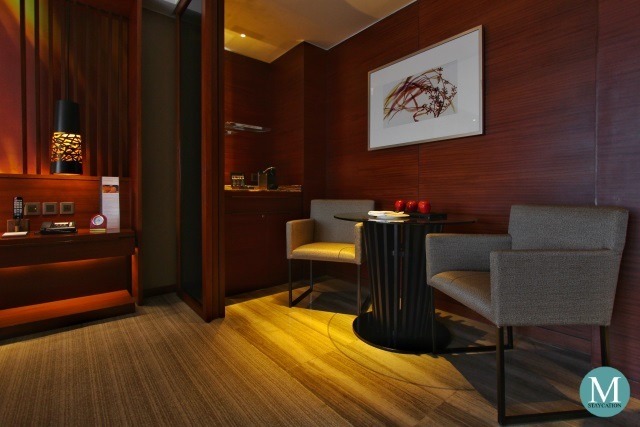 The room has an executive desk perfect for business travelers who would be working inside the room. Complimentary wifi internet is available inside the room. The telephone also serves as a multi-docking device where you can charge your mobile phones and other gadgets. When playing music with your gadgets, you can connect it to the phone via Bluetooth and use it as a speaker. In addition to the seating area next to the window, the Premier Room also has a mini dining area that can seat two persons. In-room dining is available 24 hours a day. The minibar has canned sodas and beers. 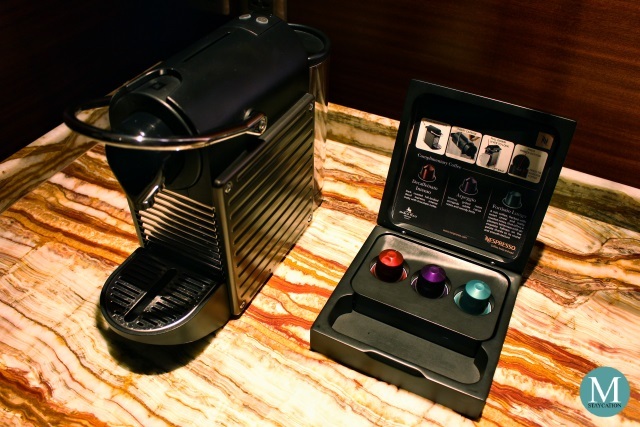 There's also a Nespresso machine as well as an electronic kettle for making tea. The room has a spacious closet with enough storage space for folded garments. Wooden hangers are also provided. The closet also stores an iron and an ironing board which are especially useful for business travelers. The bathroom is spacious and is completely covered in marbles. 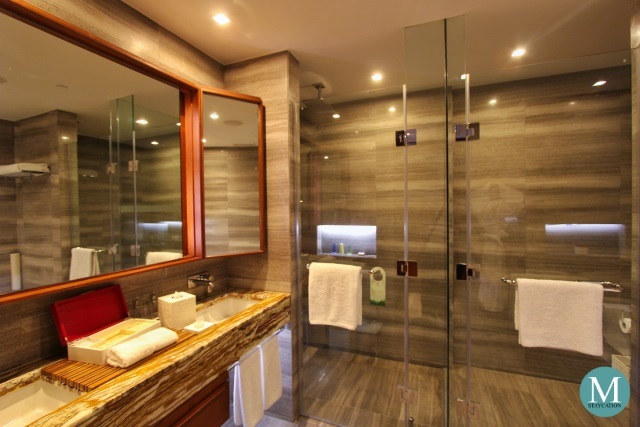 It has his-and-hers basins with a spacious counter-top for personal toiletries. Dental kits, shaving kit and vanity kits are provided. 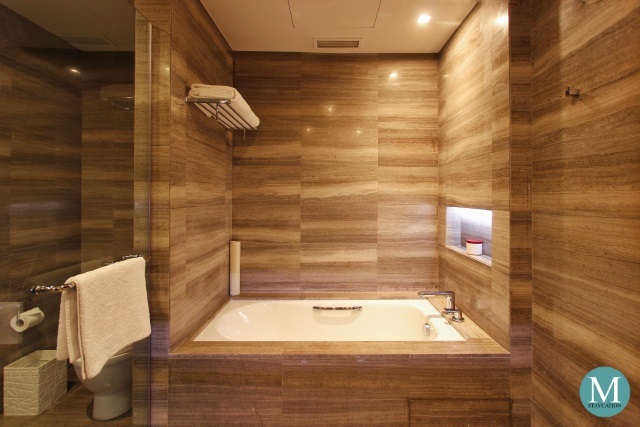 The bathroom has a separate walk-in shower, water closet and bathtub. The shower is installed with a rainfall showerhead and a handheld shower head. Hot and cold water are available with the water pressure consistently strong throughout the day. Marco Polo branded bath amenities are also provided. 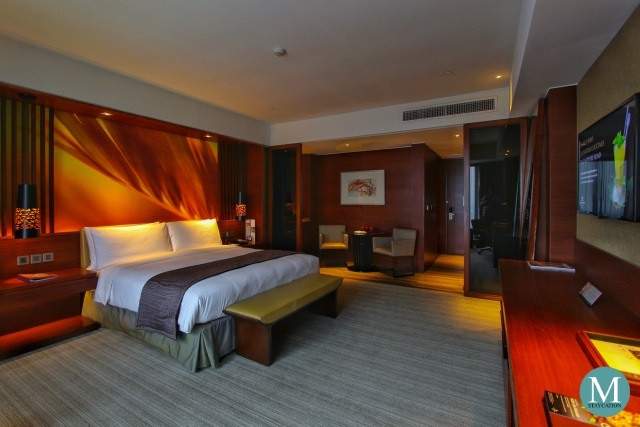 If you are looking for luxurious accommodation with some extra space to move around, I highly recommend the Premier Room at Marco Polo Oritigas Manila. 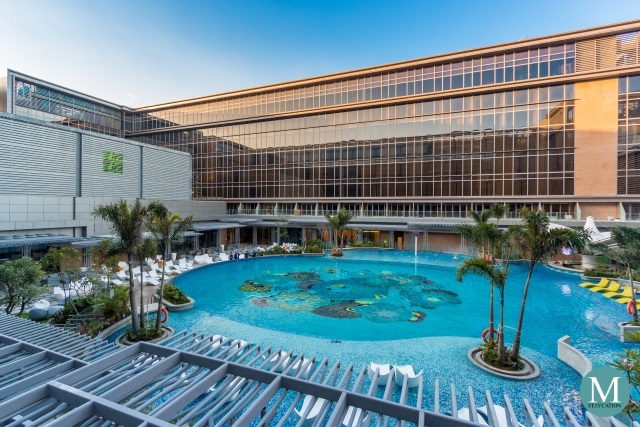 It is perfect for honeymooners or small families with young children.